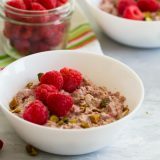 This Raspberry Overnight Oats Recipe only takes 5 minutes preparation for a hearty, healthy breakfast at your fingertips the next morning! It is a simple breakfast that you can feel good about all day long. Place 1/2 cup of the raspberries and the honey in a bowl. Crush the raspberries and honey together roughly with the back of a fork. Add the oats, pumpkin pie spice and milk. Stir to combine. Divide the mixture between 2 bowls or jars and cover. Refrigerate overnight. When ready to serve, stir half of the Greek yogurt into each bowl. Top the oatmeal with the remaining raspberries. Sprinkle the pistachios over the top.